Here are some common Frequently Asked Questions that we receive quite often. If the answer to your questions are not covered in this section please contact us and we will be happy to help. How much will my junk removal cost? How do I estimate my junk volume? If you're trying to estimate your volume of junk, take a look at our "How We Price" page that has a helpful junk estimator. Don't worry though, JUNK BOYS crews will size up your junk and review our price list with you before they begin the job. JUNK BOYS is a locally owned & operated, professional full service, junk removal company, serving the southern Ontario region. We take nearly anything that is non hazardous and that two strong people can carry. From furniture, metals, filing cabinets and old appliances to yard waste, building materials, pallets and concrete. Our crews are often available for same day service. 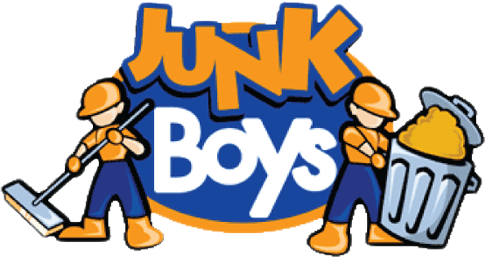 JUNK BOYS can do anything from one item jobs to multiple truckload jobs. We are licenced and insured. We are proud to have clean, well-maintained trucks and uniformed, professional crews. What kind of items can you take? JUNK BOYS can take away any non-hazardous items that two strong people can lift, such as construction materials, renovation debris, yard waste or even an old couch or mattress. Other examples include: Wood, fencing, firewood, old timber, construction timber, tiling, garden refuse, branches, hedge clippings, soil, furniture, sofas, hide-a-beds, mattresses, appliances like refrigerators, freezers, BBQ's, washers, dryers, garage and attic junk, boxes, books/ magazines, tools, tires and concrete. If you've got something else to remove and you don't see it on the list, that's no problem! Just let us know what it is. Can't you give me an exact price before I book a job? Our pricing is based on the amount of volume your junk takes up in the truck and includes all the labor, hauling and transfer station fees. It's very difficult to get a good idea of the amount of room your junk will take up without seeing it first. JUNK BOYS crews can give a detailed quote when they arrive. Up to 60% of the materials we remove are recycled. Also, although we are not a salvage company or charity, depending on if we have time or the ability to do so, we may donate specific items for reuse by those less fortunate. We generally take items that cannot be recycled to the transfer station or the dump. JUNK BOYS typically carry shovels, rakes, brooms, a dolly, or sometimes a wheelbarrow. Why would I use your service rather than a dumpster or roll-off bin? Why pay for weeks of having an ugly dumpster or roll off bin sitting outside your house or building? Instead, you can have JUNK BOYS come with our shiny new trucks and have two strong people do the heavy lifting and clean up for you. Also, you only pay for the amount of space your junk takes up in our trucks. With a dumpster or roll-off bin, you pay for the whole thing, whether you fill it or not! Why is there a charge for this service? Most services that remove items for free can only take certain things in reusable condition and often leave you with unwanted junk that you have to dispose of somehow on your own. For example, we are able to dispose of mattresses and others items that may not be resold or donated. Disposal of items at a transfer station costs us money, so does our labor and transportation of the junk. This allows our drivers to be prepared for events as traffic delays or jobs that are larger than expected. Your JUNK BOYS crew will call you 15 to 30 minutes before the time slot you have booked to provide a firm arrival time. Can you do the job for me if I'm not on site? Customers should be on site when our crews arrive. We call 15-30 minutes before we arrive to let you know we are on the way. If you are unable to be on site, the crew will review pricing on arrival and call you for confirmation. JUNK BOYS accepts credit card payments over the phone. The steel box on the back of our trucks are 12.5 feet long, 8 feet wide and 5 feet high. Are there items that you can't accept?